Sustainable development practices — conserving energy, reducing carbon emissions and protecting natural resources — are increasingly becoming ‘the norm’ for businesses and individuals. However, if you’re just getting started or are looking for additional ways to implement sustainability, here are a few simple ideas for business and at home. Businesses can consider purchasing energy produced from renewable resources or potentially installing renewable energy equipment at their facilities (e.g., wind turbines). Government incentives may be available to help offset the cost of adding such renewable energy. Energy-efficient design and construction does not necessarily cost any more than standard design and can produce both energy and cost savings. Building Design Guidance from Energy Start can help businesses manage the process. Locally, construction companies Miron Construction and Boldt can help companies with sustainable design. By evaluating your business’ paper usage, you’ll save costs as well as reduce waste and help protect forests. Some ways you can reduce paper usage include purchasing paper with high recycled content, printing documents double-sided, printing on the backs of previously printed documents and, of course, recycling as much of your office’s paper as possible. Some ways businesses can save water resources include installing high-efficiency fixtures (faucets, toilets, water heaters, etc.) using faucets that automatically turn on and implementing ‘green’ landscaping practices that limit the need for watering. For additional ideas and resources, consult with the Wisconsin Sustainable Business Council, which is a statewide initiative that brings together companies that are interested in incorporating sustainability practices into their operations. Admit it. You can still hear your mom saying this to you – and she was, of course right. Turning off unused lights is one of the most basic ways to reduce energy usage and lower your electric bill. Also, turn off your computer when you’re not using it — keeping it on 24 hours a day, 7 days a week can easily add $200 to your electric bill every year. Also, unplug small items like phone chargers and toasters when they’re not in use — you’re wasting energy just by using the socket. 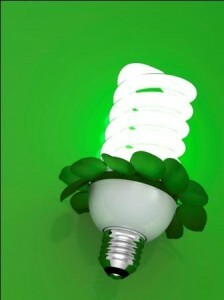 If you have not done so already, it is time to replace your incandescent light bulbs with compact florescent ones. They cost a bit more, but they last a lot longer and use a lot less energy. When buying a new appliance, make sure it has an Energy Star sticker. Energy Star is a government-backed program helping businesses and individuals protect the environment through superior energy efficiency, which can help you cut your electricity costs. When it comes to drying your clothes, do like your grandmother used to (if you have the space and/or the time) and use a clothes line. This will prevent you from having to use and energy-hungry clothes drier. When cooking with the oven, turn it off a few minutes before the food has finished cooking, using the heat that is built up for the remaining time. Using tap water and a filter rather than purchasing bottled water, not only will save you money, it saves resources: It takes 17 million barrels of oil to produce water bottles each year and 3 times the amount of water to make the bottle as is does to fill it. View this infographic to learn more.